Basically, a monomictic breccia results from rock deformation by shearing and granulation (cataclasis) in the process of tectonism or – more general – dislocation metamorphism. If the dislocation metamorphism is impact-related, the produced cataclasite may be termed a monomict impact breccia. We should be aware that it may be difficult to distinguish between monomictic impact breccias and monomictic tectonic breccias and that the use of the term “monomict impact breccia” may in some instances be problematic. Therefore, the term “monomictic movement breccia” may be more appropriate. This term has been introduced by Reiff (1978) by discussing monomictic breccia complexes in the Steinheim, Ries, Sierra Madera, Flynn Creek, Decaturville and Wells Creek impact structures. In the Wells Creek impact structure, these breccias were called crackle breccias and homogeneous rubble breccias (Wilson and Stearns, 1968) and later considered variants of the same phenomenon (Reiff 1978). Related textures are grit brecciation and mortar texture (Hüttner, 1969). 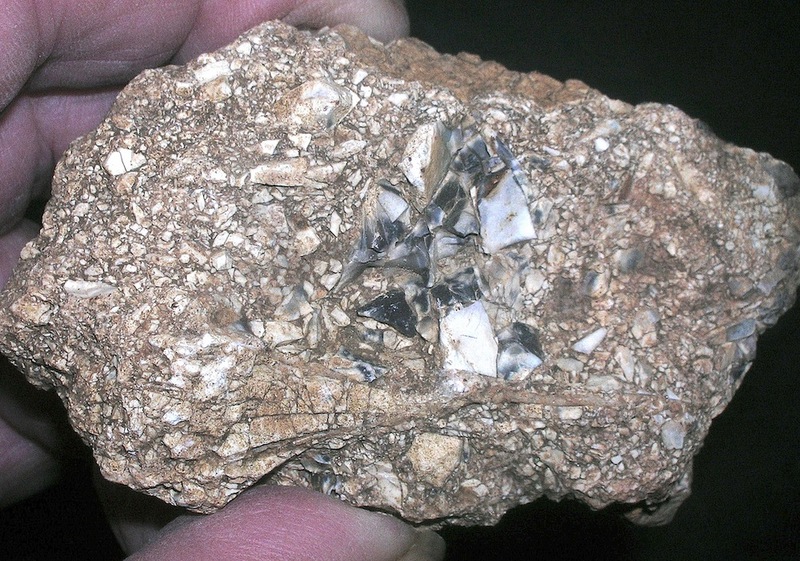 In each case, a drastic brecciation of whole rock complexes with resulting grain sizes down to sand and silt fraction and frequently preserved fitting of the fragments is observed. This peculiar brecciation requires intense movement under very high confining pressure. In the impact structures referred to above, these movement breccias occur in excavated/ejected megablocks, in the crater floor, in inner rings and central uplifts. Reiff (1978) points to the fact that the typical texture of monomictic movement breccias is also observed in breccias from giant rock falls (for example the 1,500 m Flims, Switzerland, rock fall) and may in rare instances occur along tectonic fault zones. The occurrence of monomictic movement breccias in environments lacking tectonic fault zones and gradients sufficient for mass rock falls are strong clues to impact cratering events (Reiff 1978). A new provisional approach (2007) to an impact breccia nomenclature by the IUGS Subcommission on the Systematics of Metamorphic Rocks can be read here: http://www.bgs.ac.uk/SCMR/docs/papers/paper_11.pdf . According to this classification and nomenclature the monomictic breccias are defined as parautochthonous occurrence in the crater basement which is far from any geologic reality (see Fig. 1, 2). Our critical review of this IUGS impact rock systematics which is little recommendable may be clicked HERE. Fig. 1. Monomictic impact breccia (monomictic movement breccia); dislocated megablock, Malmian limestone; Ries impact structure, Iggenhausen quarry. Typical monomictic grit brecciation. Fig. 2. Monomictic impact breccia, grit brecciation, Iggenhausen quarry, close-up. 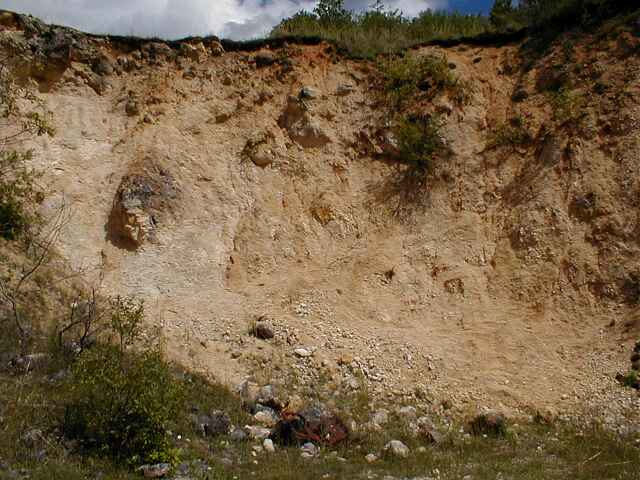 The occurrence of heavy monomictic brecciation uninterruptedly over hundreds of meters can only be explained geologically by an impact event if a huge rock fall can reasonably be excluded. Tectonics is unable to produce such a scenario which can exemplarily be observed in the large Spanish impact areas. Impact petrologists and mineralogist are always claiming that shock effects in minerals like diaplectic glass and planar deformation features (PDFs) as well as geochemical meteoritical signature are indispensable for establishing an impact structure because these manifestations are unknown from Earth endogenetic processes. We would like to argue that these immense drastic rock deformations are equally diagnostic for an impact event because there is no geologic endogenetic process on Earth capable to produce such an impressive scenario. Unfortunately, impact is still strongly dominated by a petrological/mineralogical and geochemical view, although in the first place impact structures are clearly a geologic phenomenon. Fig. 3. 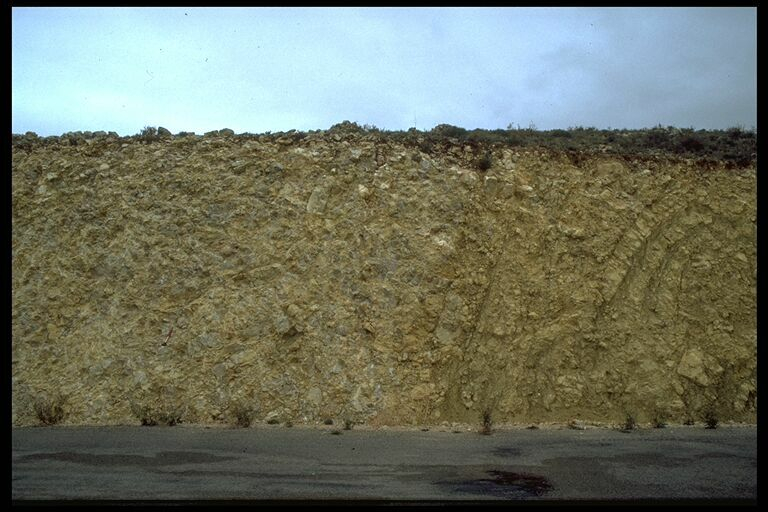 Extensive monomictic movement breccia in Paleozoic quartzites; quarry near Lagueruela, rim zone of the Azuara (Spain) impact structure. Fig. 4. Close-up of the monomictic movement breccia in Fig. 3. Over large volumes, the quartzite rock is ground to finest fraction and in part pulverized which has required enormous compressive forces. Fig. 5. Extensive monomictic movement breccia in the rim zone of the Azuara impact structure; quarry in Jurassic limestones, north of Belchite. Fig. 6. Close-up of the monomictic impact breccia, grit brecciation, in Fig. 5. 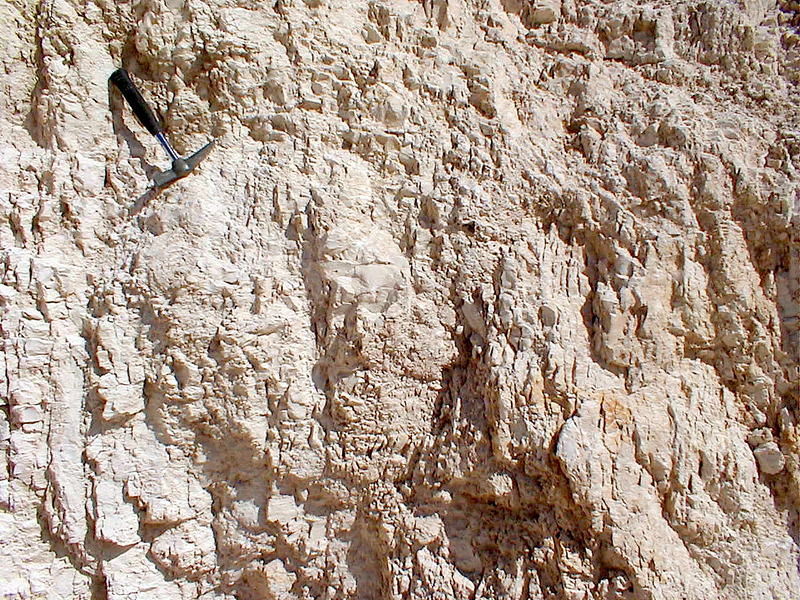 It is obvious that the quarry operators have an easy job when exploiting the otherwise very solid Jurassic limestones. Fig. 7. 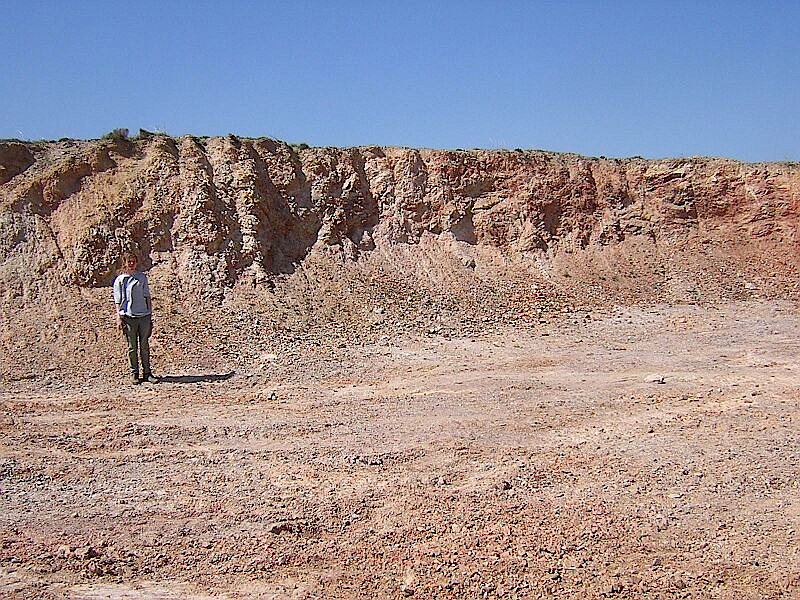 Monomictic large-scale megabrecciation of a Dogger limestone complex where only a relic stratification is preserved. 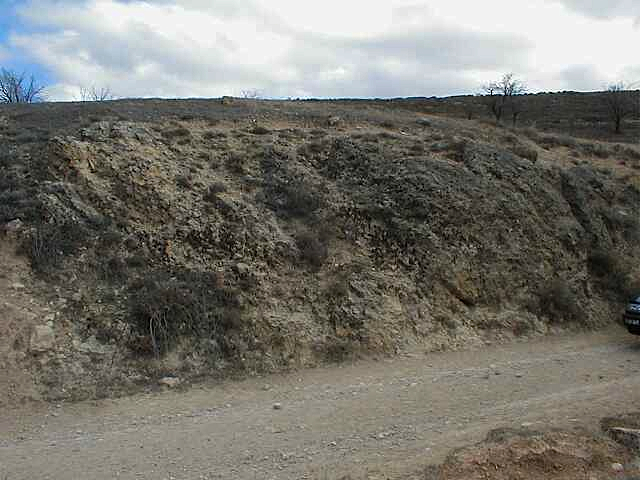 Rubielos de la Cérida impact basin, road from Bueña in the central uplift chain down to the basin in the west. Fig. 8. 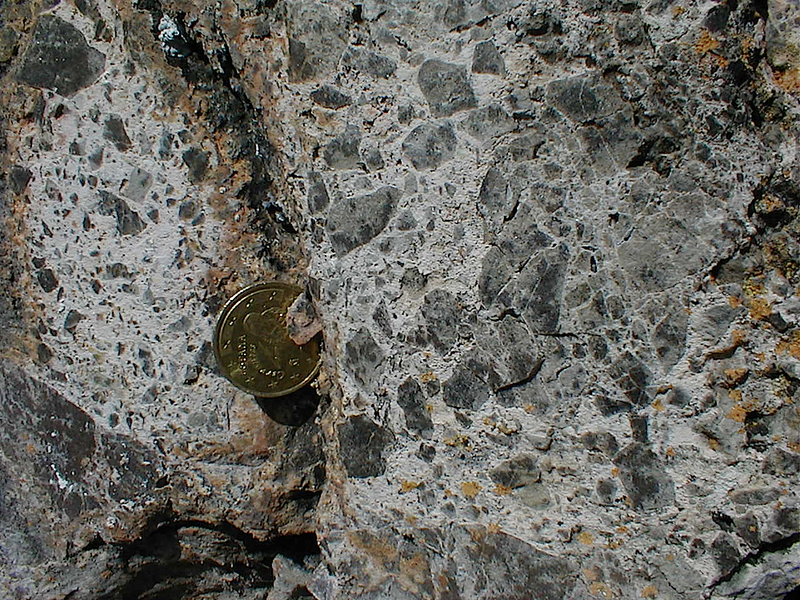 Monomictic movement breccia, dislocated megablock; Azuara impact structure, near Cucalón. Fig. 9. 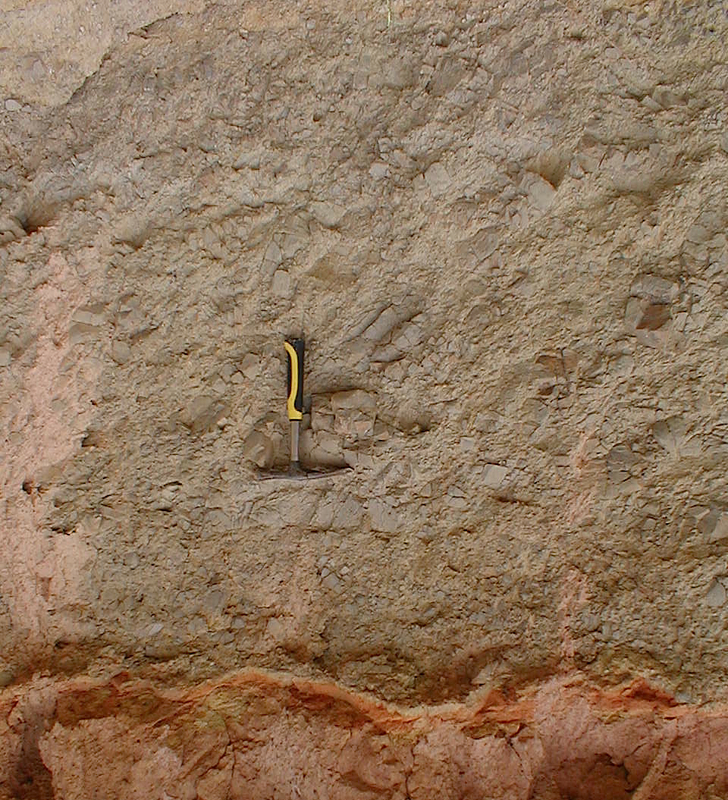 Monomictic movement breccia, dislocated megablock; Azuara impact structure, near Cucalón. Grit brecciation in close-up. Fig. 10. 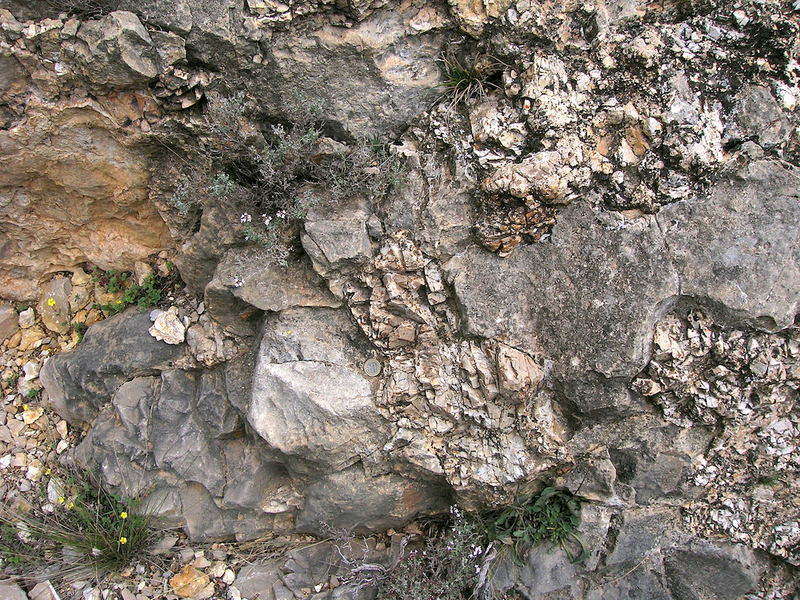 Extensive monomictic movement breccia, rim zone of the Rubielos de la Cérida impact basin, road between Escorihuela and El Pobo/Corbalán. Grit brecciation and mortar texture. Fig. 11. Monomictic impact breccia, mortar texture; Devils Wall breccia dike, near Olalla, rim zone of the Rubielos de la Cérida impact basin. 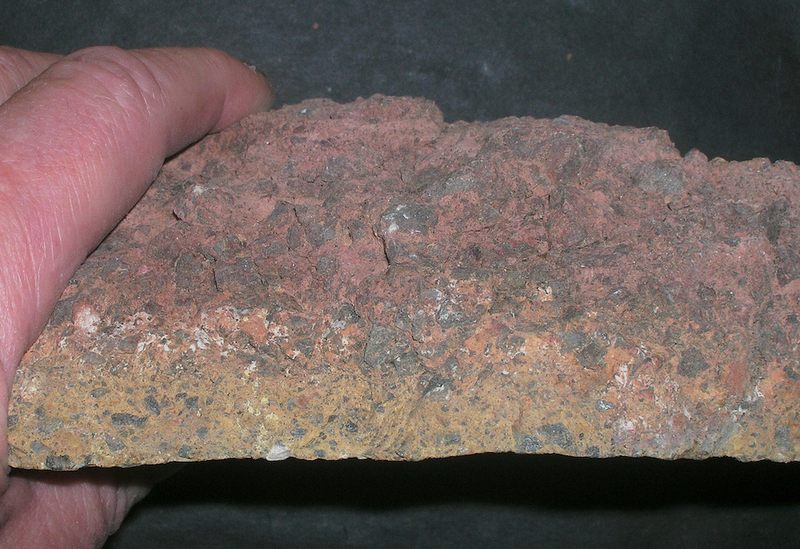 The term “mortar texture” relates to the picture of bricks fixed in a fine-grained cement mortar. Fig. 12. Typical mortar texture in a monomictic breccia. Azuara impact structure, near Herrera de los Navarros. Fig. 13. Monomictic impact breccia (monomictic movement breccia); Herrera de los Navarros, Azuara impact structure. Fig. 14. Monomictic impact breccia (monomictic movement breccia); Daroca thrust, Azuara impact event. Fig. 15. 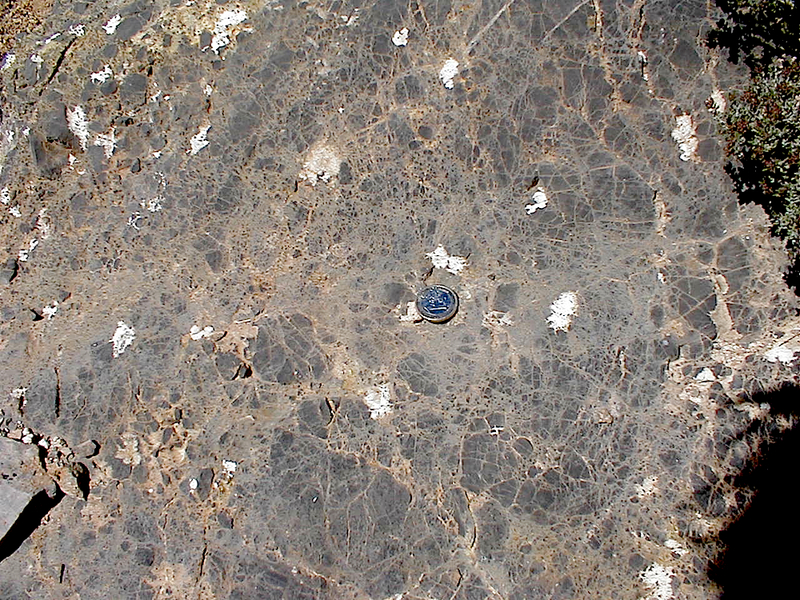 Monomictic movement breccia displaying distinct mortar texture; Siljan (Sweden) impact structure. Fig. 16. Monomictic movement breccia, Lake Hummeln (Sweden) probable impact structure. 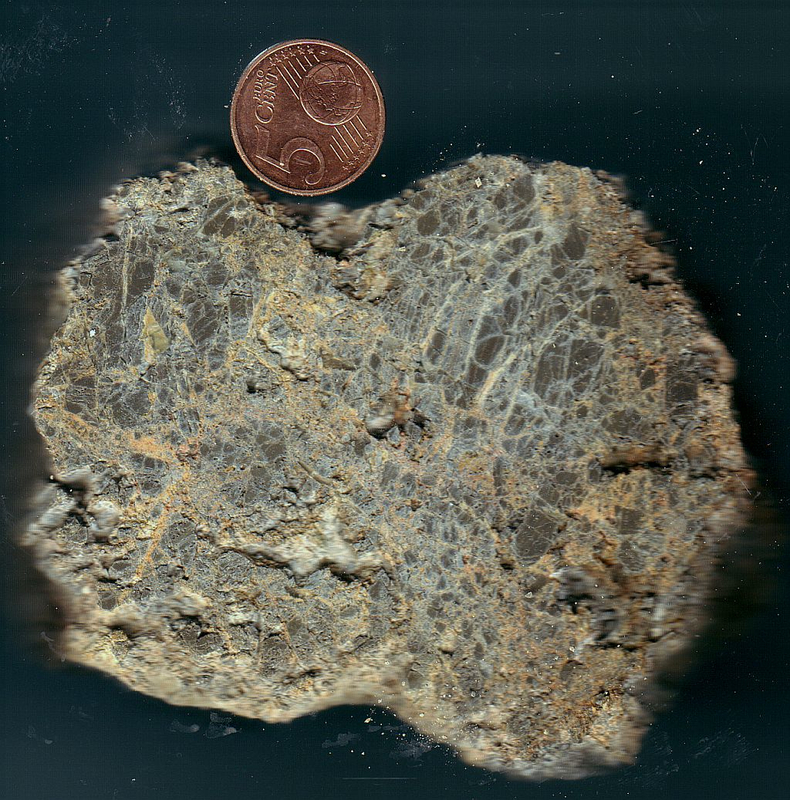 Because of its different fracture-mechanical behavior chert nodules embedded in limestones frequently show a distinct monomictic brecciation within widely untouched embedding carbonate material. A shock concentration in the nodules must be taken into consideration. 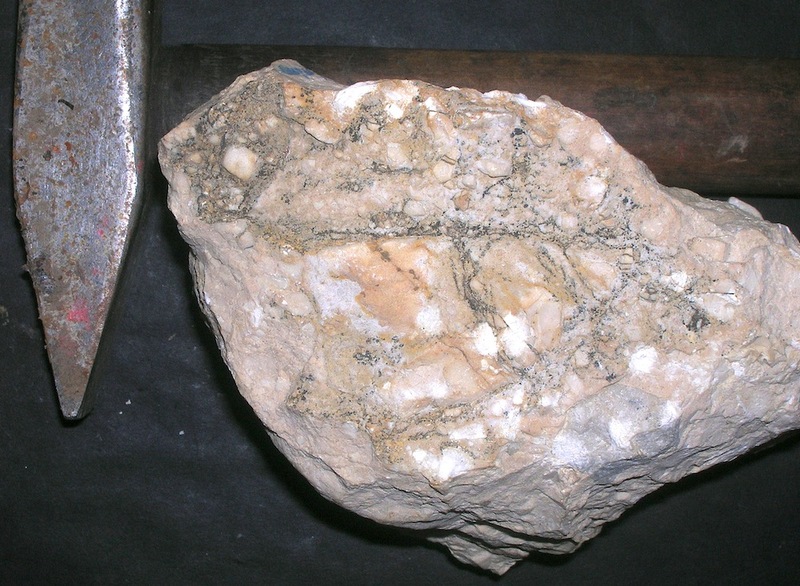 In the strict sense the shattered nodules may not be called a breccia in many cases, because a definite matrix is lacking. Fig. 17. 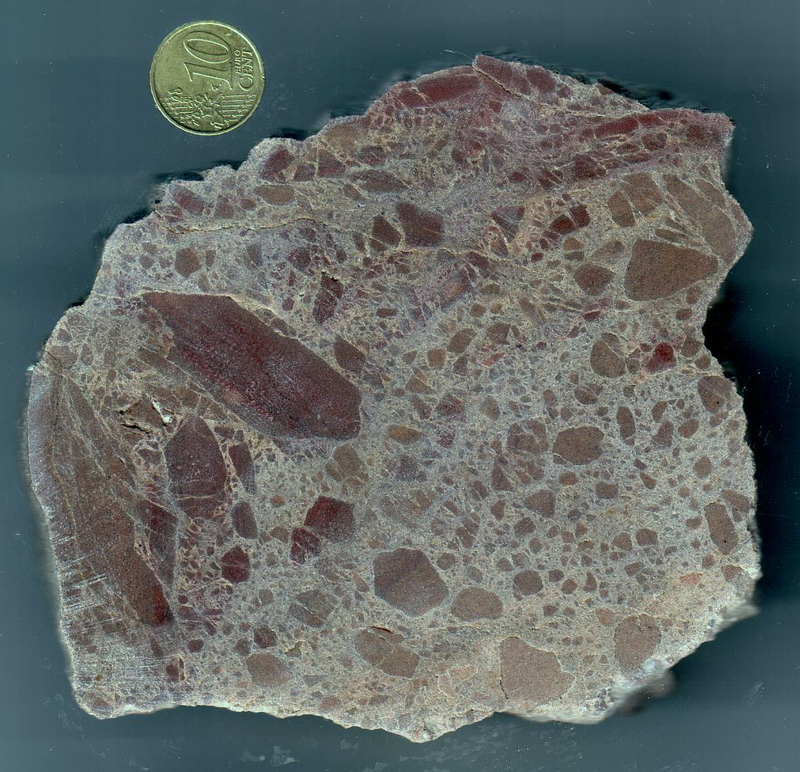 Strongly brecciated chert nodule (monomictic breccia) taken from Malmian limestone. Ries impact structure, crater rim near Holheim. Fig. 18. Heavily brecciated chert nodule (monomictic breccia) taken from Malmian limestone; Azuara impact structure, northern ring zone south of Fuendetodos. Fig. 19. Heavily shattered chert nodules in seemingly untouched Jurassic limestone. Sierra Palomera, central uplift chain of the Rubielos de la Cérida impact basin. 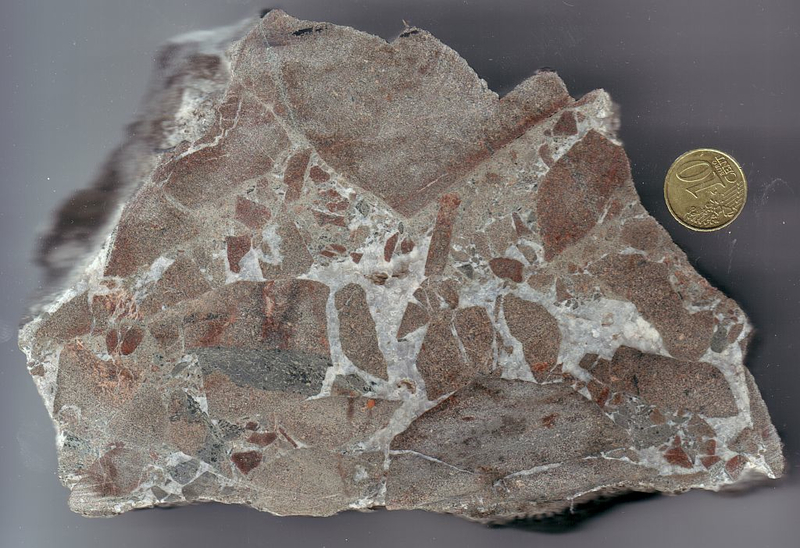 A monomictic movement breccia in the true sense of the word may develop in a high-pressure rock slide, especially in impact structures, where it can be observed to occur immediately below rock polish of a striated surface (“Schliff-Fläche“). Fig. 20. Heavily brecciated and polished scour surface. 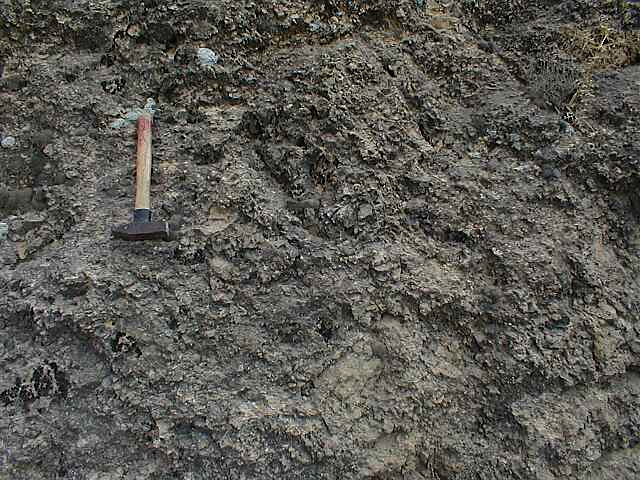 Contact between Muschelkalk limestone and Paleozoic shales. 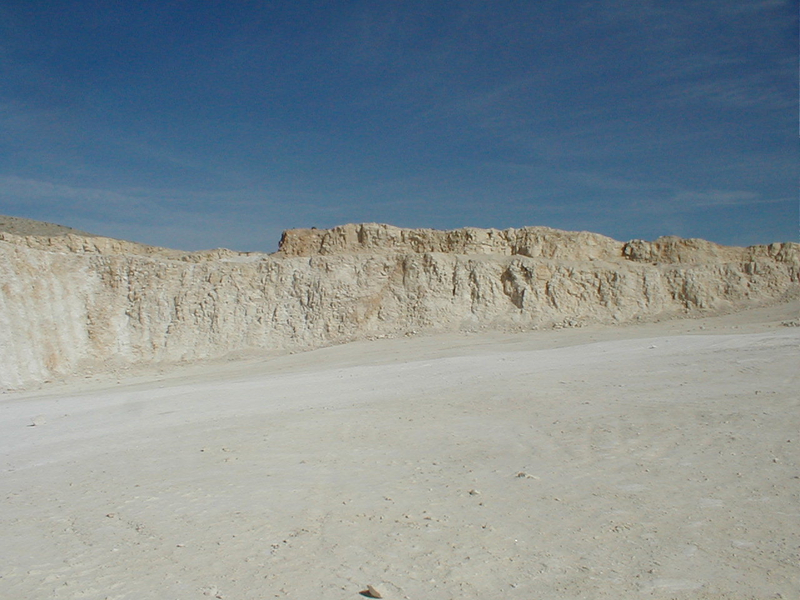 Rim zone of the Rubielos de la Cérida impact basin, near Olalla. Fig. 21. 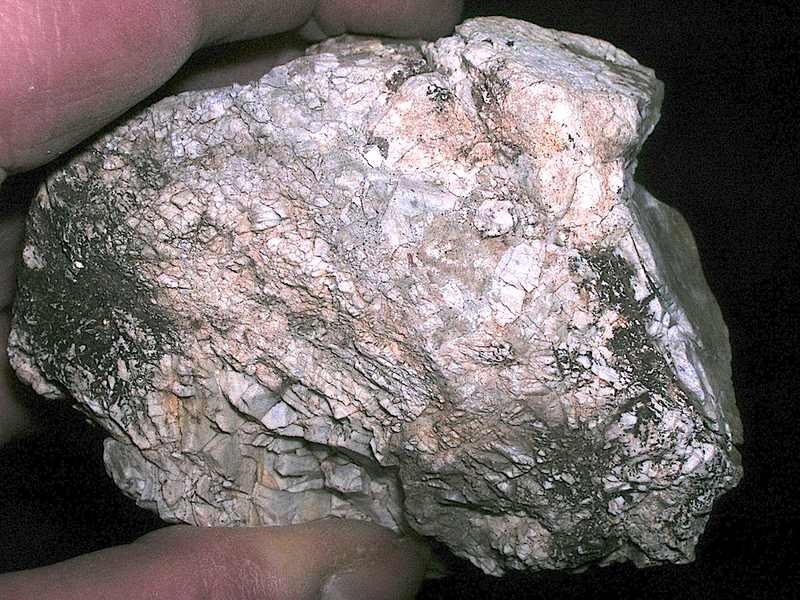 Side view of the sample from Fig. 20 exhibiting the heavy monomictic brecciation below the polish. Fig. 22. Striated surface (Schliff-Fläche) and monomictic brecciation from the high-pressure contact with soft Jurassic claystones. Ries impact crater; Holheim exposure at the crater rim. Fig. 23. Side view of the sample in Fig. 22 showing striated surface and monomictic brecciation below. Fig. 24. 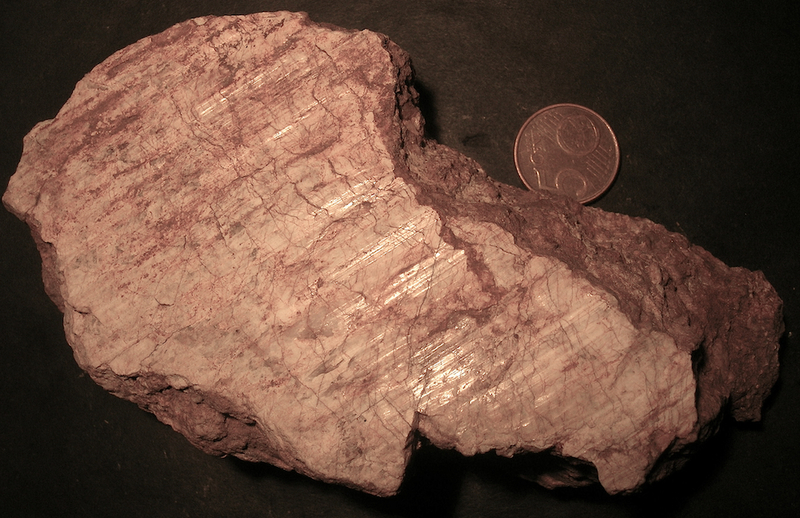 Striated and heavily polished surface of a monomictic breccia; near Portalrubio, Rubielos de la Cérida impact basin, Spain. Fig. 25. Striated and heavily polished surface of a monomictic breccia; Fombuena, Azuara impact structure, Spain. Sometimes, some problems may arise with regard to a proper classification of impact breccias and monomictic breccias in general. 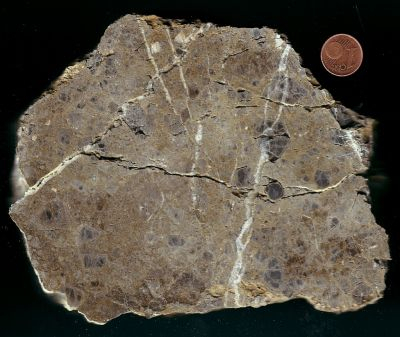 Practically in all textbooks and Internet texts on breccias the term “monomictic breccia”denotes a breccia in which the angular clasts have the same composition and are fragments from one rock. However, this definition lacks any word about the matrix and its origin. We may imagine a tectonic monomictic fault breccia composed of the same clast and matrix material. No trouble at all. As a characteristic example Fig. 26 shows a breccia from the rim zone of the Rubielos de la Cérida (Spain) impact basin. 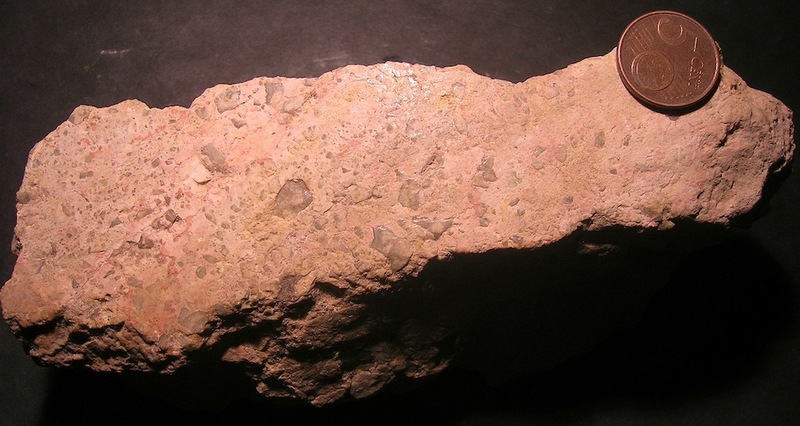 The clasts unquestionably have originated from the same Muschelkalk dolomite basically constituting a monomictic breccia with distinct mortar texture in a clastic brownish-grayish Muschelkalk matrix. 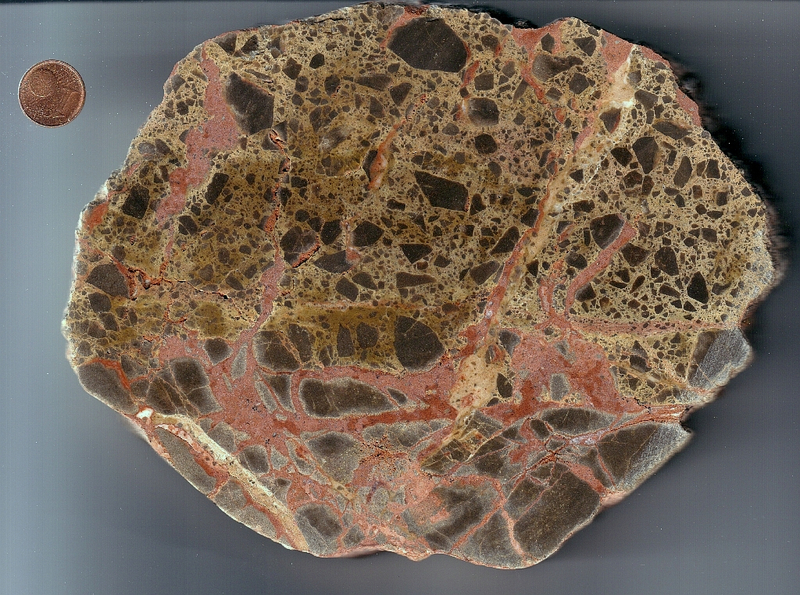 However a second-generation carbonate matrix of reddish color has intruded into the first-generation breccia, and a third dike-like breccia of whitish color can be observed to have penetrated the reddish matrix (Fig. 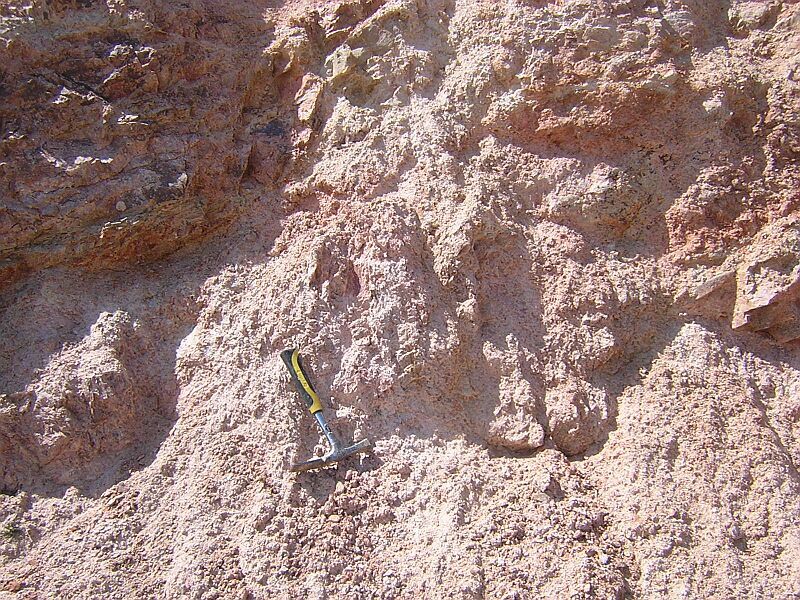 27) – all in all a three-generation breccia-breccia dike rock. Obviously, this rock does not match any of the well-established impact breccias and classifications. 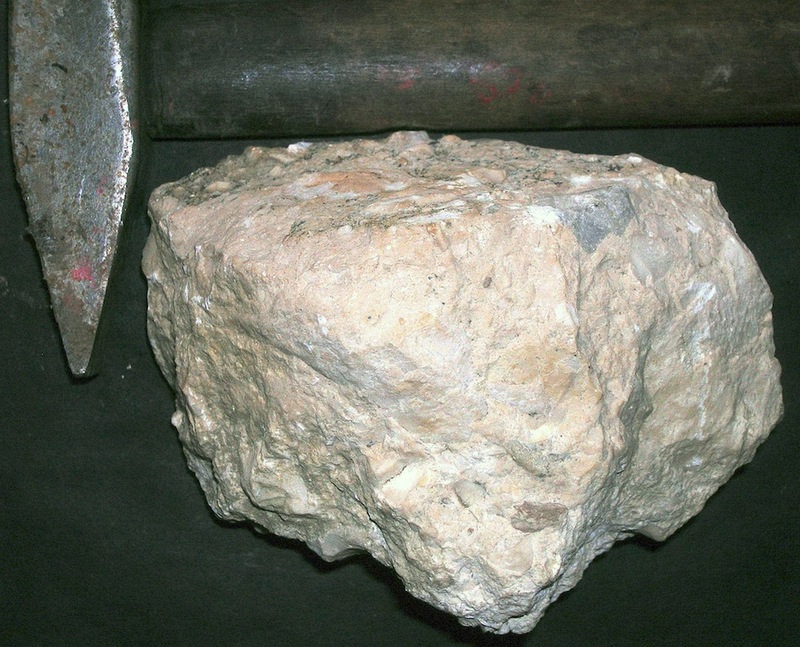 Obviously, too, a formation in a “normal” geologic process provides nearly insoluble problems. Fig. 26. 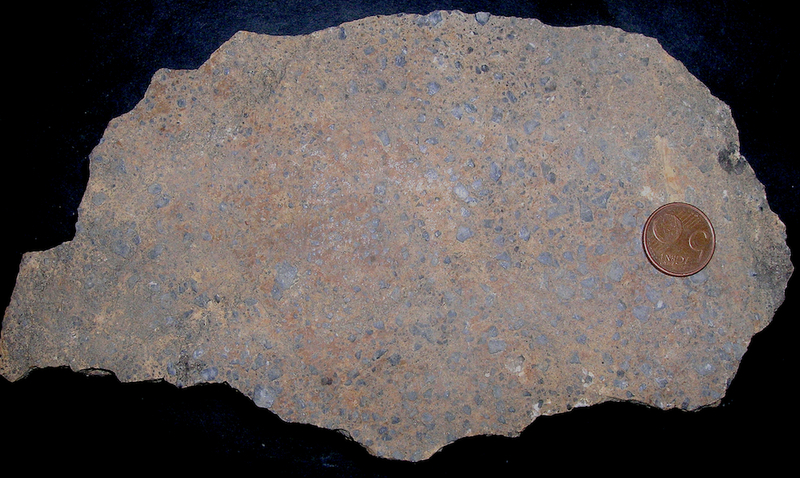 Complex three-generation breccia texture in a rock from the rim zone of the Rubielos de la Cérida impact basin near Olalla (see text above). Fig. 27. 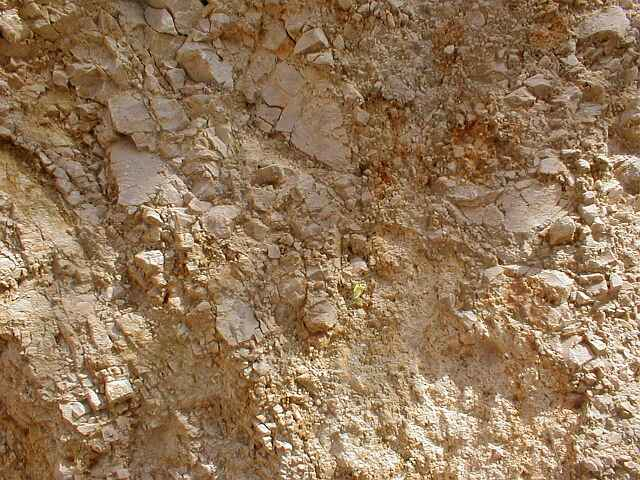 Close-up of the breccia in Fig. 26. On close inspection of the breccia it may tell a complex story of formation.